Enjoying wildlife (OK, captive wildlife) at Nashville Zoo. When I started writing my rhino series, I did not plan to fall so hard for the ancient dual-horned behemoths. I was planning to write about the conservation work going on at American zoos. 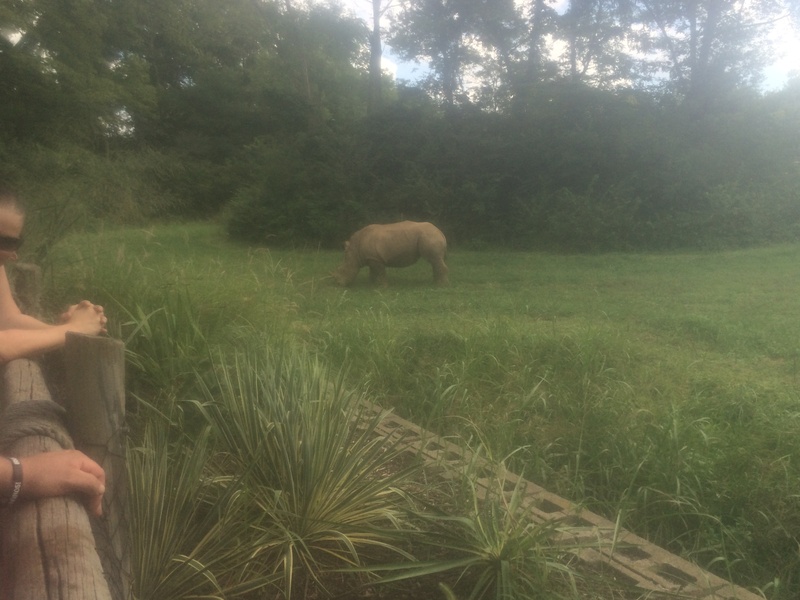 It just so happened that my local zoo had just acquired four rhinos. “What world did they come from?” I wondered. Then I fell down the rhino hole. It turns out that rhino conservation exists at the nexus of many tensions caused by globalism. Rhino conservation – with its researchers, NGOs, veterinarians, zoos, park rangers, ranchers, animal orphanages – functions at the intersection of global crime rings and black markets; of national politics and corruption. It’s like we of this anthropocene are observers of a great rail yard, where trains of diverse species and millions of years of evolution meet and switch up with trains of global development, technology, and population growth – trains trying very hard to avoid a crash. On the one hand, massive train wreck seems inevitable. But down on the yard, conscientious people are doing their jobs to keep the trains flowing smoothly. All this has raised the stakes on watching and enjoying nature, particularly our great mammals. I’ve worked in many HQ marketing departments. And I can say that working in headquarter offices all over America, countless individual wildlife lovers sneak to YouTube between tasks for a glimpse of wildlife videos. As they peck out 40-hour workweeks they help feed, house, and propagate endangered animals in $20 or $40 increments. They become members of sanctuaries and volunteer to help. And if lucky, they travel to see the animals in their home habitat. I am planning just such a trip to Namibia and Botswana. Somehow, in studying about rhinos, I got the idea that I had to go to there – to the natural habitats where rhinos roam. As a worker in America, I want connection to that greater wildlife world. And I’m not alone in this. Quietly tiptoeing alongside working wildlife lovers like me, American business leaders with large pockets look for wildlife investments in foreign countries. They may be hunters investing in Safari ranches in South Africa or Tanzania or Zimbabwe. They may be travelers investing in luxury lodges on the vast plains of Namibia. They love animals; they want return on their investments. With these requirements, they urge nations towards stability; they have the potential to bring a lot of good – jobs, money, sustainable practices. Our goals align; we should all be working together. As I read the Tweets and follow the local papers of South Africa, Zimbabwe, Namibia, Botswana, I know there’s a dark side. Poverty, poaching, corruption, they ever threaten to upset the conservation balance. An elephant tramples a farmer. The family seeks restitution (or retribution, = dead elephant). A black market king pin is caught but not prosecuted. A young poacher is killed on sight. A whole crash of rhinos is found slaughtered. All this threatens to dismantle conservation work along with prosperity for the greater good. Namibia, Botswana, South Africa – they seem breathtakingly beautiful. But even on a quick Google search, you can also see the underbelly. In pleas for money from NGOs, we learn about the needs – education for local youth, tools and supplies to prevent poaching, train rangers, support tourism projects, rescue wounded animals. But here’s where I bumped into an information void. What does it mean to support sustainability across very different nations? A traveler can become a volunteer (which includes a “donation” – basically pay to play) or sign up for eco travel through a number of organizations – many of them based in South Africa and the UK. Eco-travel websites and brochures promise that when you book with them you will be supporting “sustainability,” local people, wildlife. I joined a travel forum to hear from eco-travelers. I heard things like “I assume my contribution went to the community” or “I hope my visit helps these people out.” These travelers offered a vague sense of how the system operates. In fact, what determines a good system? For example, both governments and NGOs evaluate a community before it receives eco-tourism support. What are they looking for? Can my travel decision help? Namibia, a country with vast desert land (made famous by “the desert elephants”) is known for its effective water management. How does a traveler support sustainable practices? How does she avoid encouraging or contributing to exploitation? I am not someone to embark on an eco-adventure without seeing the bigger picture. Show me how I can exert positive influence in my travel choices. I applaud the vision of rhino-inhabited nations like Namibia and Botswana to conserve both wildlife and habitats while building human prosperity. Show me what my travels can do to push this hopeful agenda forward. When I go, you bet I want to see rhinos. But I also want to know the people and understand the challenges. Working in America has given me a gift I can share with aspiring nations. I also feel the sustainable systems they implement will return to help us some day. This begins a series, Conscientious Wildlife Travel – Have Fun; Make Change. Hopefully, animal lovers, travelers, culture buffs, and conservationists alike will find it interesting. I chose Namibia and Botswana for my travels, for reasons that will come up in the series. Articles will include interviews with people running eco-friendly businesses, sanctuary operators, safari hunting experts, conservation experts, environmental experts. It will include advisory updates from America’s new International Wildlife Conservation Council. Over time, I hope that travelers might want to visit these beautiful wild places. And those who want to support conserving the habitats and populations of endangered animals will feel confident as travelers, knowing how to have maximum impact. Editor and journalist Marianne Messina spent 10 years covering performing arts for Metro Silicon Valley, in CA. She developed four unique online magazines at FriendFinder, and spent 3 years as their managing editor before relocating to New England to develop a web community and magazine for the Rhody arts community, ArtsmashRI. As storyteller and marketing editor, she has helped translate expert research into story form, including latest findings in the field of health, sleep, and brain science pertaining to Binge Eating Disorder, working with BED expert Dr. Ralph Carson (The Brain Fix). Messina keeps up her journalism chops by covering issues that matter in wildlife and conservation. She occasionally writes in other genres, including an award-winning screenplay (Rhode Island Film Fest), and shuttles dogs to homes for Bullmastiff Rescuers International (BRI).